At Maria Shelter, a temporary safe place for displaced women in times of crisis in Chicago’s Englewood neighborhood, many of the residents find the practical endeavors of finding work and housing consumes their time. But since last spring, a group of University students, who comprise the South Side Scribblers, have been encouraging the women to take some time to create. 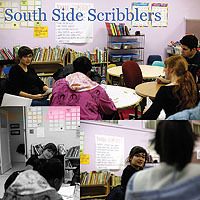 Though the South Side Scribblers have been conducting writing seminars for children in area schools since 1994, the program at Maria Shelter is the first writing workshop for adults that the college students have put together. So far, it’s been successful. Each week, the workshops begin the same way—the college student facilitators select writings they think will interest the group, the group reads and discusses the writings together, and then everyone writes an extemporaneous piece on a theme that emerges from discussion. In order to achieve that goal, the group adopted a strict rule: Everyone participates in the reading, discussion and writing, including the student facilitators. This approach results in a seminar setting in which everyone learns from each other. In this way, the South Side Scribblers are able to leverage some of the resources they have as University students to create opportunities for reflection and self-expression these women might not otherwise have at their fingertips. For example, due to a grant from the University of Chicago Women’s Board, the Scribblers are able to purchase books for their programs free from the 57th Street Seminary Co-op Bookstore. Each year, the Scribblers publish an anthology of the best elementary school student writing in their programs. Cogan and Gigerenzer hope to duplicate that effort with Maria Shelter writings this year.